The Prototype Global Sustainable Development Report illustrates a range of potential content, alternative approaches, and various ways of participation, in order to support Member States' deliberation on the scope and methodology of future editions of the Report. It maps sustainable development assessments and related processes and highlights emerging issues identified by scientists; assesses sustainable development progress; tells the “stories” of future pathways toward sustainable development based on the literature and discusses investment and technology needs; assesses various approaches to measuring sustainable development progress; identifies lessons learnt from national, regional and global case studies of the climate-land-energy-water-development nexus; presents illustrative science digests for decision-makers; and summarizes various views of Member States and others on the process, methodology and scope of future reports. At the second meeting of the HLPF, overwhelming preference was expressed for the second option: a multi-stakeholder, multi-level approach to preparing future reports. The Ministerial Declaration of the HLPF reconfirmed the need for and the mandate to prepare the GSDR. Responses to the questionnaire on scope and methodology of a global sustainable development report were received from China, Costa Rica, Croatia, the European Union, Indonesia, Japan, Jordan, the Russian Federation, Switzerland, Tunisia, and the UK, as well as from CDP, ESCAP, ECLAC, UNEP, UNCTAD, and WMO. In addition, related written inputs were considered from experts and UN partners who participated in expert group meetings that were convened in support of the Report in 2013. .This includes, inter alia, written responses by CBD, ECE, FAO, IAEA, UNEP and UNESCO. Social and natural scientists, here is your chance to provide your ideas and suggestions for the Global Sustainable Development Report! Your inputs will be fully considered in determining key messages and findings of the Report. The aim is to collect a wide range of views from scientists, especially young scientists, representing scientific communities across the world. There are one or more questions for each chapter of the Report (see outline). You may rate ideas submitted by other scientists and/or add your own ideas. Please try to be specific and concise, as idea inputs are limited to 140 characters each. There is no limit to how many ideas you submit or how many votes you make for ideas. Please note that the information below is user generated and does not necessarily represent the views of the United Nations or its senior management, see disclaimer. In case you encounter technical issues using the widgets below, you may want to try the direct links provided in this PDF file. For your vote to be registered, you need to enable cookies in your browser. Cookies allow us to calculate things like the median number of votes per session and the average number of times voters return to their wiki surveys. Which sustainable development issue should decision-makers consider for action? Which sustainable development assessment would you like to bring to the attention of decision-makers? Which message on sustainable development assessments do you prefer for Chapter II? Which message on global sustainable development progress do you prefer for Chapter III? What do you think the world will be like in 2050? What kind of world would you like to see for yourself, your children and grandchildren in 2050? What "means of implementation" are needed more for achieving global sustainable development? "Means of implementation" are, for example, finance, technology, trade, and capacity building. What policies or actions are needed more for achieving global sustainable development? What is a more suitable, overall measure of progress toward sustainable development? Which message or idea should we include in the Climate-Land-Energy-Water-Development Nexus chapter? Which overall finding or policy recommendation should we highlight in the Global Sustainable Development Report? This question will be opened for inputs as soon as we will have received a significant amount of inputs for chapters I to VI. Please check back later to make your contribution. Estimados científicos del área de las ciencias sociales y naturales, ¡ésta es la oportunidad de ofrecer sus ideas para el Informe Mundial sobre el Desarrollo Sostenible! Sus aportes serán muy relevantes en la determinación de los mensajes y conclusiones clave del Informe. El objetivo es reunir un amplio abanico de puntos de vista de los científicos, especialmente los jóvenes científicos, de las comunidades científicas de todo el mundo. Hay por lo menos una pregunta relacionada con cada uno de los capítulos del Informe (véase el esquema). Usted podrá votar en las ideas presentadas por otros científicos y/o añadir sus propias ideas. Le rogamos ser específico y conciso en sus aportes, ya que cada campo de entrada tiene un límite de 140 caracteres. No hay límite de aporte de ideas o de votos. Por favor, tenga en cuenta que la información que sigue es generada por los usuarios y no representa necesariamente la opinión de las Naciones Unidas o de su dirección; véase el aviso legal. En este momento las pestañas abajo funcionan mejor con Microsoft Internet Explorer. Si encuentra incompatibilidades con su navegador, puede utilizar los enlaces directos en el siguiente archivo PDF . ¿Qué tema de desarrollo sostenible debe ser tomado por los tomadores de decisiones para su acción? ¿Qué evaluación del desarrollo sostenible quisiera traer a la atención de tomadores de decisiones? ¿Qué mensaje de las evaluaciones del desarrollo sostenible elegiría para el Capítulo II? ¿Qué tema sobre el progreso global hacia el desarrollo sostenible elegiría para el Capítulo III? ¿Cómo cree que será el mundo en 2050? ¿Qué clase de mundo le gustaría para sí mismo/a, sus hijos y sus nietos en el 2050? ¿Qué "medios de implementación" más se necesitan para lograr el desarrollo sostenible globalmente? "Medios de implementación" son, por ejemplo, las finanzas, la tecnología, el comercio y la creación de capacidades. ¿Qué políticas y acciones más se necesitan para lograr el desarrollo sostenible a nivel mundial? ¿Qué medida global de avance hacia el desarrollo sostenible es más adecuada? ¿Qué mensaje/idea debería figurar en el capítulo sobre el nexo clima-tierra-energía-agua-desarrollo? ¿Qué conclusión general o recomendaciones sobre políticas deberían ponerse de relieve en el Informe Mundial sobre el Desarrollo Sostenible? Esta pregunta estará abierta para recibir aportes en cuanto se haya recibido una cantidad importante de insumos para los capítulos anteriores. Por favor, siga verificando esta página para que pueda hacer su contribución en cuanto se habilite. The Global Sustainable Development Report will aim to provide a simple guide to map out salient regional and national assessments on sustainable development, and highlight their features for policy makers' easy references. If you have questions or are interested in making a contribution to the section on national assessments, please contact us here. 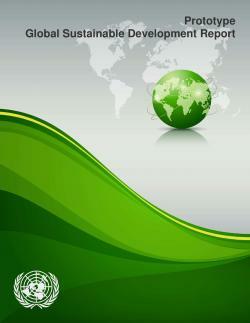 The preparation of the Prototype Global Sustainable Development Report was coordinated by UN-DESA’s Division for Sustainable Development and involved the collaboration of multiple UN entities including the CBD, ECLAC, ESCAP, ECE, ESCWA, FAO, ILO, IAEA, IMO, OHRLLS, UNCCD, UNCTAD, UNEP, UNESCO, UNFCCC, UNFPA, UN-Habitat, UNIDO, WFP and The World Bank. The IMF participated as an observer. Preparation of the Prototype Report also involved a wide network of natural and social scientists, including scenarios and other modelling communities. If you are interested in making a contribution to the future editions of the report, please contact us. A number of quantitative and qualitative tools are being used in the preparation of the Global Sustainable Development Report. They will be described here in due course. One example of the tools developed specifically for this report is an open-source, global model of the climate-landuse-energy-water-development nexus (CLEW). An integrated systems approach is used to find innovative solutions to the simultaneous achievement of multiple objectives. When interconnections are being taken into account between activities to address objectives in the climate, land-use, energy, water, materials and development areas, better solutions can be identified that resolve important trade-offs building on synergies. In order to provide a firm basis for the emerging, national-level CLEW assessments and planning exercises, the United Nations works with the Royal Institute of Technology (KTH) to develop a global model. Such model may also support decision-making on the planned Sustainable Development Goals (SDG), as the areas covered by the model overlap with those typically highlighted as priority areas by Governments in the SDG process. The model will allow for the visualisation of the effects of policy decisions in key sectors of relevance for sustainable development. The tool allows for direct economic comparison between policy options and illustrates environmental consequences and social implications. In fact, it is a mini-SDG model. It is being developed as an open-source tool (using OSeMOSYS) with input data derived from an open-process. In addition, academic articles reviewing the landscape of assessments for sustainable development may also be submitted. To make a contribution or for further information, please contact us at http://sustainabledevelopment.un.org/account.php?menu=1727. The following is a list of the publications and outlooks considered in the present report. Direct Web links are provided for ease of reference.